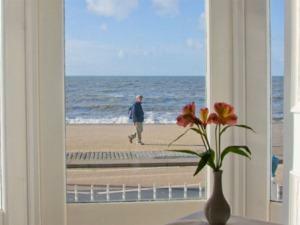 The Richmond Guest AccommodationThe Richmond boasts the prime seafront location on the main Aberystwyth Promenade overlooking Cardigan Bay and is a short stroll from the town centre, train and bus stations, the University, Arts Centre and The National Library of Wales. 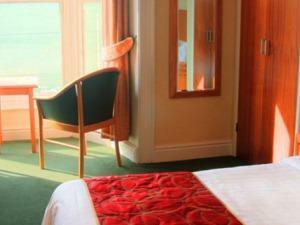 Offering smart, modern, comfortable and well-equipped en-suite rooms, most with King Size beds and stunning sea views. Accommodation is located over three floors but please note that there is no lift or ground floors rooms. Free Wi-Fi is available throughout the building. All areas are non-smoking. Friendliness and warm hospitality are hallmarks of a stay here. Enjoy hearty breakfasts, tasty evening meals and good wine with a relaxed yet attentive style of service. A free off road private car park is provided and a huge bonus in this part of town. Also available an on-site lockable garage for motorbikes, bicycles and classic cars – please enquire. The Richmond boasts the prime seafront location on the main Aberystwyth Promenade overlooking Cardigan Bay and is at the heart of town. All room have ensuite facilities. The hotel has its own large private car park.